Zeta Customer Relationship Management (CRM) Software Dubai, UAE refers to a technological solution that helps businesses manage customer relationships in an organized way. Zeta CRM is considered as a tool that improves productivity and overall business functionality. CRM software is bundle of all necessary modules all together to provide services like customer database management, keep track of customers orders pre sales and post sales. It keep track of customers information from Lead stage to Order conversion as pre sales activity. Post order to supply of product and services, track of payment, maintenance and support along with warranty. Zeta Software LLC is well known CRM Software Company and CRM Software Provider in Dubai, UAE, Kuwait, Bahrain & Saudi Arabia. Our CRM software provide you excellent planning statistics which is based on customers past record and order value. CRM allows to analyse opportunities to cross sell the services and products based on his business and growth. Another value addition of CRM software to boost internal process of management of customer and service plan and offer by enabling trace on follow ups and proposals to order conversation. Zeta’s Customer Relationship Management software gives you a 360-degree evaluation of your complete sales cycle and pipeline. Zeta CRM maintains accurate contact records of your communication with your customers. Zeta CRM maintains accurate contact records of your communication with all your customers in the different regions including Dubai, Kenya, Bahrain, Qatar, Oman, Kuwait, Bahrain and Saudi Arabia. We centralize and store massive volumes of customer and prospect data – from contact history to social media activity – and make it available in real time. This data can be leveraged to retain your best customers and maximize the effectiveness of every customer interaction–whether it’s sales, service, or marketing. Throughout the course of a typical day, you communicate with a number of business associates, managing their communications is vital to your business. 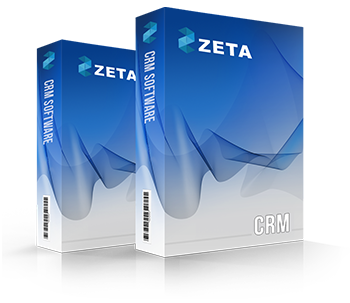 Zeta CRM is not only a Contact Management Software but robust Customer Relationship Management software with one of the shortest implementation time of any CRM system on the market. It will help any small to medium sized business increase revenue by creating long-lasting customer relationships. The better you know your customer the more effectively you will anticipate their needs and retain their business. With Zeta CRM you will stay on top of every customer interaction, and accurately forecast sales, manage sales process. Dealing with your customers support issue effectively is vital to your business. Zeta CRM maintains accurate details of the support calls and manages support escalations. Whatever your business, Zeta CRM has the strength, flexibility and agility you need to exceed your customers’ expectations, all at a price that ensures a rapid return on your CRM investment. We help your work get smarter, productive and close more deals in less time. Keeps track of works done by each Sales Executives in the organization. Competitor’s details are displayed against the product selected. The Order In CRM can be converted to the Sales Order in the Distribution Module. Tracks the steps involved before generating a sales order. Each Opportunity can be assigned to the concerned sales executives.